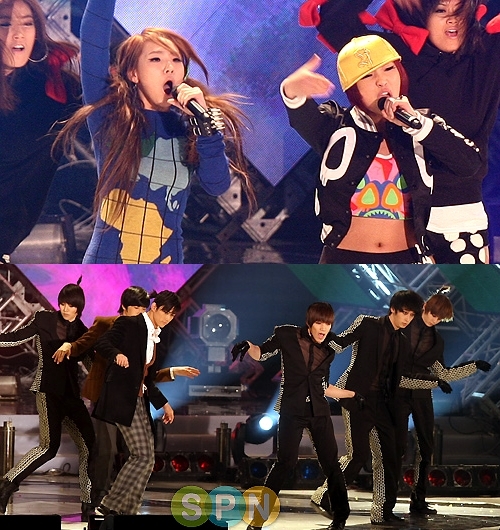 MBC aired Copyright Clean Concert on 12th December at the timeslot for MBC Music Core at 4pm. 2PM revealed a special MV for the ‘Clean Song’ with their hit ‘1o points out of 10′. The MCs to the concert are So Nyeo Shi Dae Yuri and Tiffany. And some of the performing artistes for the concert are 2PM, SHINee, Park Jin Young, BEAST, MBLAQ, H-Eugene, Brian, Maya, Secret, Rainbow etc. Girlgroup Rainbow is hailed as the bluechip of the advertisement zone. The group has been receiving ‘love calls’ (another term for offers) to model for various products like chicken, cosmetic and clothing lines. They are from the same company as idol groups like SS501 and KARA, and even before debut they are the talk of many music fans looking forward to their debut. And also, after having KARA Goo Hara being called the Namie Amuro lookalike,Rainbow Kim JaeKyung is said to be lookalike to Japanese singer actress Ayase Haruka. Today on KBS Music Bank, 2PM wins #1 with their comeback hit ‘Heartbeat’. On 22nd November, there was no Inkigayo aired on the usual Sunday time slot, instead SBS broadcasted the NongShim Love Sharing Concert. The 10th ‘NongShim Love Sharing Concert’, done together with the Korean Red Cross, aimed to help the needy people. The visitors can come to the event by bringing 2 bags of NongShim Shin Ramyeon as their donation. And for the concert, some great performances lineup, including duet single performance by 2NE1 CL and Gong MinJi with ‘Please Don’t Go’. Go under the cut for the rest of the performances. Today on SBS Inkigayo, SHINee wins their 3rd Mutizen – triple Crown – with hit ‘Ring Ding Dong’. Too bad leader Onew cannot be present to share the joy. TaeYang and 2PM comeback stages! Park Bom performs ‘You And I’ live on SBS Inkigayo for the 2nd time! DSP Media’s new 7-member girlgroup Rainbow had their debut stage on 14th November on MBC Music Core performing their debut song ‘Gossip Girl’.